The Physical Assessment, often referred to as the Mechanical Assessment Tool (MAT) is commonly used by seating clinicians as part of the seating assessment process. It is a form of biomechanical assessment and physical evaluation, forms the second part of the Wheelchair Assessment Process, and consists of three elements, with information from each of these assisting wheelchair service personnel to decide how much support the wheelchair user needs. * A person who cannot feel or has 3 or more risk factors is at risk of pressure sores. It is important to find out what method of propulsion the wheelchair user will use to push, as this can affect the choice of wheelchair and the way it is set up. Flexible to Neutral Posture; With gentle force the parts of the wheelchair user’s body that are not in neutral can be brought to neutral. In this situation the right support should be given to help the wheelchair user maintain a neutral sitting posture. Flexible Part way to Neutral Posture; With gentle force the parts of the wheelchair user’s body that are not in neutral can be moved only part way toward neutral. In this situation support is given to help the wheelchair user sit as close to neutral posture as is comfortable and functional for them. A starting point for understanding the wheelchair user’s posture and what support may be needed is to observe his/her sitting posture – without support. For this part of the physical assessment the wheelchair user sits on an assessment bed. Make sure the wheelchair user is safe and that his/her feet are supported. Have an assistant or family member/caregiver sit with him/her if he/she cannot independently, sit safely. Observe whether the wheelchair user can sit in a neutral/upright sitting posture without support. The purpose of observing sitting posture without support is to understand the wheelchair user’s postural tendency/habits. Observing sitting posture is a skill, which takes time and practice to develop. Sitting posture is influenced by what is happening around the pelvis and the hips. In this part of the assessment wheelchair service personnel need to determine if the wheelchair user’s pelvis is level when viewed from the front, and whether the hips are able to bend to a neutral sitting posture (trunk to thigh angle is more than 90 degrees), with or without support. If the pelvis is not level or the hips cannot bend to neutral sitting posture, the wheelchair service personnel need to consider whether the wheelchair user can sit in neutral posture with support or if not, how close to the neutral posture they can sit? If the wheelchair user cannot sit in a neutral sitting posture, it is also important to know if this is limited by a restriction either above the pelvis in the lumbar spine or below the pelvis in the hip joint. 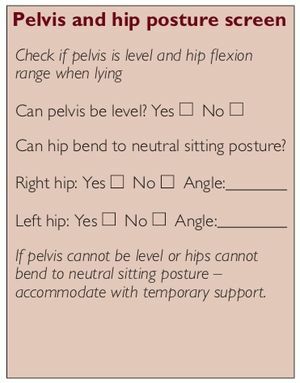 In order for the wheelchair service personnel to answer all the questions above it is necessary to carry out a ‘pelvis and hip posture screen’ part of the assessment. This is not a full Range of Motion assessment but aims only to identify the factors noted above. You may choose to carry out a more extensive Range of Motion Assessment in order to gather more detailed information. Understand the structure of the wheelchair users skeleton and the influence of the various muscle groups on the articulation of the joints. Understand body planes and ranges of movement to identify fixed vs. flexible deformities. assessor records if the pelvis can be level on the intermediate wheelchair assessment form. assessor bends the leg that is not being tested slightly at the knee, resting the foot on the mat. This helps to reduce the tension in the hip being tested. This leg may need to be supported. 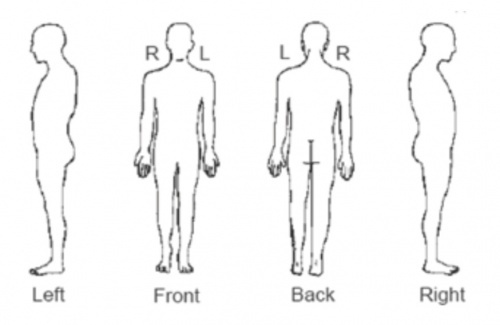 assessor records if right and left hip can bend to neutral sitting posture on the intermediate wheelchair assessment form. assessor records right and left hip angle degree measurements on the intermediate wheelchair assessment form. Assessor can also draw the angle of the goniometer on a separate piece of paper or on the back of the intermediate wheelchair assessment form. 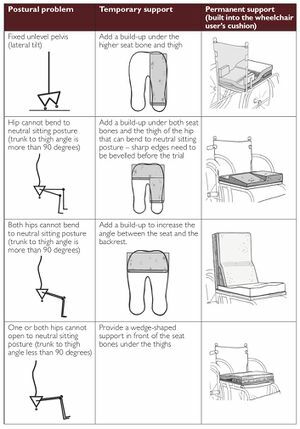 Consider temporary supports for a fixed unlevel pelvis and for the hips that cannot bend to neutral sitting posture. If the pelvis cannot be level or the hip cannot bend to a neutral sitting posture, it will need to be supported in the non-neutral posture in the final wheelchair. To continue the assessment, a temporary support should be made for the wheelchair user to sit on. During an assessment, the temporary support will: allow the wheelchair user to sit with more stability and balance; stop the wheelchair user from compensating for the unlevel pelvis or hips that cannot bend to neutral sitting posture and allow the wheelchair service personnel to carry on the assessment and concentrate on the rest of the wheelchair user’s posture including pelvis, trunk, head, neck and legs. It is often necessary to have more than one pair of hands when completing a Hand Simulation, so team work is key. Take help from the assistant, who could be a co-worker, trained assistant, family member or caregiver. Involving family members/caregiver will also help them to better understand the final Postural Support Device solution that is selected. Finally ensure you only make one change at a time and observe how the changes in one part of the body affect other parts, always getting feedback from the wheelchair user. observe how moving the pelvis towards neutral affects the wheelchair user’s trunk, hips, head and neck. explain carefully to the assistant where to hold and how to hold the pelvis. Check that he/she is able to do this before moving on. observe the contour of the pelvis and trunk from the side. This is important to plan the shape of the backrest to provide the best support. provide additional support for the arms. During the hand simulation, ask the assistant supporting the pelvis if they feels any changes as you support the trunk. Remember to always ask the wheelchair user for their feedback. Once the pelvis and trunk are supported in the most neutral sitting posture that is comfortable, check the posture of the head and neck, hips, thighs and lower legs. Use your hands to find out how close to neutral each body part can comfortably move. Continue to check how any change affects the rest of the body. Continue to ask the wheelchair user for their feedback. 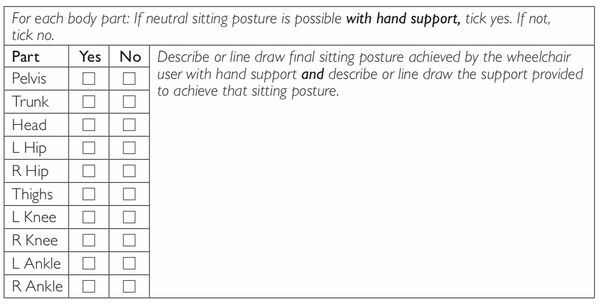 describe or line draw the support provided for the wheelchair user to achieve that sitting posture.